Tropical neurology is a pertinent subspecialty of neurology. However, in the past, it did not receive the attention it deserved. 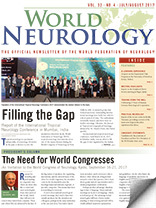 In the World Federation of Neurology (WFN), tropical neurology was introduced as one of the major themes during the World Congress of Neurology in New Delhi in 1989. A research group was formed and some outstanding international meetings were held, but only for a short period of time. The enthusiasm eventually waned, and there were no further meetings. Likewise, the Journal of Tropical and Geographical Neurology, initiated by Dr. Charles Poser, also faded quickly. An international tropical neurology conference, held March 24-26, 2017, in Mumbai, India, was an effort to fill the gap. It was organized by the Indian Academy of Neurology under the aegis of the WFN. Dr. R. S. Wadia served as the organizing president, while Dr. Chandrashekhar Meshram was the organizing secretary. The conference, dedicated to Prof. Noshir H. Wadia, was inaugurated by WFN President Dr. Raad Shakir. Speakers of the International Tropical Neurology Conference 2017 demonstrated the revived interest in the topic. The last credible meeting on tropical neurology was held in the mid-1990s. The organizers were mindful of the over 20-year gap. Nevertheless, the congress was an outstanding success. Attended by nearly 1,000 delegates, with 46 speakers eminent from Austria, Brazil, Honduras, India, Malaysia, Peru, Sri Lanka, South Africa, Tanzania, U.K., U.S., and Vietnam, the congress has completely filled the long gap. The topics discussed included neurology of common infections, cerebral malaria, Ebola virus, konzo, sarcocystosis, nodding syndrome, rabies, Zika virus, and bacterial meningitis, among others. Debate, CPC, neuroradiology, and neuropathology sessions were also part of the scientific program. There were standalone symposia on central nervous system tuberculosis, the neurology of HIV, encephalitis, poisoning, and neurocysticercosis. Seventy-nine papers were presented. Dr. Shakir highlighted the role of the WFN in training and education in the developing world. Not only did the congress prove to be an academic bestseller, it achieved what could be, as well as what could not be, accomplished in the 20-year gap: reigniting a flame of interest in tropical and geographical neurology and resurrection of the WFN Research Group on Tropical Neurology. The research group was revived with Dr. Meshram, president, and Dr. Amilton Barreira, secretary general, in leadership roles. The Research Group on Tropical Neurology was formed with a mission to foster research collaboration into poorly understood aspects of neurological disorders prevalent in the tropics and to disseminate knowledge at international and regional levels in this neglected area of neurology. One of the ways of achieving the mission objectives would be to organize regular biennial meetings of the Tropical Neurology Research Group in different locations, with a local emphasis on tropical disorders. The Research Group also will strive for representation of tropical neurological disorders in the scientific program of the World Congress of Neurology. An eventual undertaking should rightfully be the revival of the Journal of Tropical and Geographical Neurology. Acknowledgements are due to all those who contributed to the Congress, including the eminent faculty, but most of all to the WFN for its generous support and to Dr. Shakir for the constant encouragement.